Reid My Mind Radio: Holy Braille! If we take a look at the evolution of the printed word over the years, it’s clear that technology has made real advancements possible. From desktop publishing to the promise of a paperless society. The advancements in Braille haven’t been as exciting. It’s still not an affordable option for many. And mobile options provide reduced output. In this latest production for Gatewave Radio, learn all about The Holy Braille Project from the University of Michigan’s Haptix Lab. 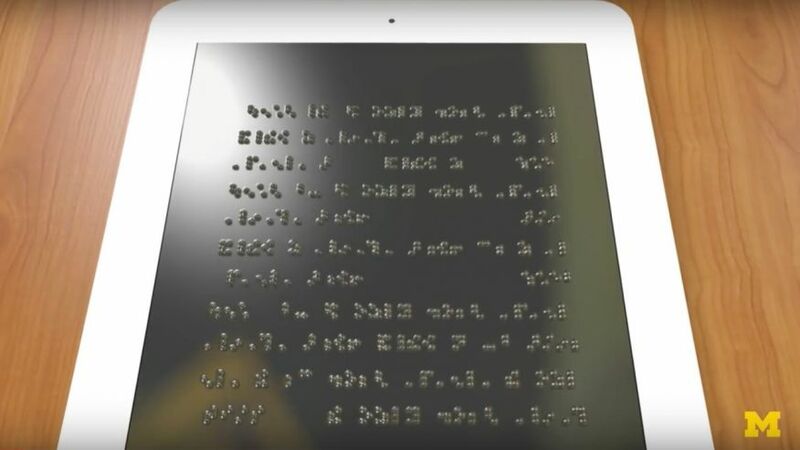 They’re working on an affordable full page Braille display with the potential of being a fully functioning tablet with its own tactile graphic user interface. In this episode, I make reference to the importance of Braille for those who are Deaf-Blind; an often forgotten segment of the population. Well, the only method for accessing digital information is via electronically Braille displays. A few weeks ago I began thinking of changing my workflow in order to create written transcripts in order to make my content fully accessible. See, by creating a podcast we exclude the entire Deaf community. As someone who believes in access for all, it’s time to step up my own game. So going forward I am going to try my hardest to make transcripts available. I’ll keep it in the post but have it after the resource notes. In the 1800’s Louis Braille who was blinded as a child, modified the Night writing system developed in Napoleon’s Army. This tactile system enabled soldiers to safely communicate with one another under the cover of the night’s sky. Ever since, the system of multiple cells, each consisting of some combination of 6 raised dots translating into alphabet, numbers, contractions and punctuations, enable literacy for those who are blind. The challenge of Braille has been, bringing it into the 21st century. There are digital Braille displays . They’re also bulky and expensive. We’re talking about over 2 thousand dollars. At most 80 braille cells can be displayed at once on a device. And these are the most expensive and bulkiest. Devices today demand a more compact form factor allowing for greater mobility. The Holy Braille project developed out of the University of Michigan is creating a more affordable and light weight product that will display a full page of Braille cells. Brent Gillespie and Sile O’Modhrain. I’ve been on this project for 4 years now. My role is on the kind of technology development and research side. …but it doesn’t allow for passively learning the spelling of a word. And certain types of information can be more difficult to understand and process audibly. We’re looking to create a device that is both able to create multiple lines of Braille on a page but then also to be able to render content that would take up more than a single line of Braille so that would include graphs, spreadsheets, maps some kind of tactile images that you can feel. As text is visually displayed on a monitor or screen; small pins configured into cells matching the Braille cell are lowered and raised rendering the translated Braille cell. As the user moves through the text on the screen, the corresponding text is rendered on the braille display. Traditionally, in order to control these bubbles on a surface you need an electronic control valve or a separate one for each bump you want to control. So if you have a thousand bubbles on a surface you need a thousand external control valves. What happens it gets very bulky if you go about it that way and it gets difficult to manufacture. Several components will impact the final price of the product. The cost of materials are one. Labor is another and the ease at which a product can be manufactured can greatly reduce the retail price tag. The way we’re going about it is actually integrating all that valving and circuitry that’s used to control those bubbles into the same sub straight as the bubbles themselves . And so what you get is a highly manufacturable device that is made similar to how a computer chip is made. I like to draw the comparison that we have computer chips that are essentially made in a chemical process that are kind of built up like 3D printed almost so that when it comes out it’s already fully integrated and you have all the different parts of the computer chip already connected together. No one’s sitting there piecing it together themselves. Just imagine a machine that takes all the ingredients; processes them together to automatically build the final product. Eggs, water, Flour, sugar and more sugar! The machine is programmed to use the exact amount of ingredients to create a batter and heat at the exact temperature for just the right amount of time. No longer does someone have to manually crack the eggs, measure the flour and so on. It’s the same manufacturing process to create an array of dots that’s maybe a hundred dots than it is to create one that’s a thousand dots. So you have a little bit of a scalability there where it may be more expensive to create just a single device out of this technology but you get these economies of scale when you create a very large device. It’s not like the price is scaling linearly or the cost of making the device is scaling linearly. 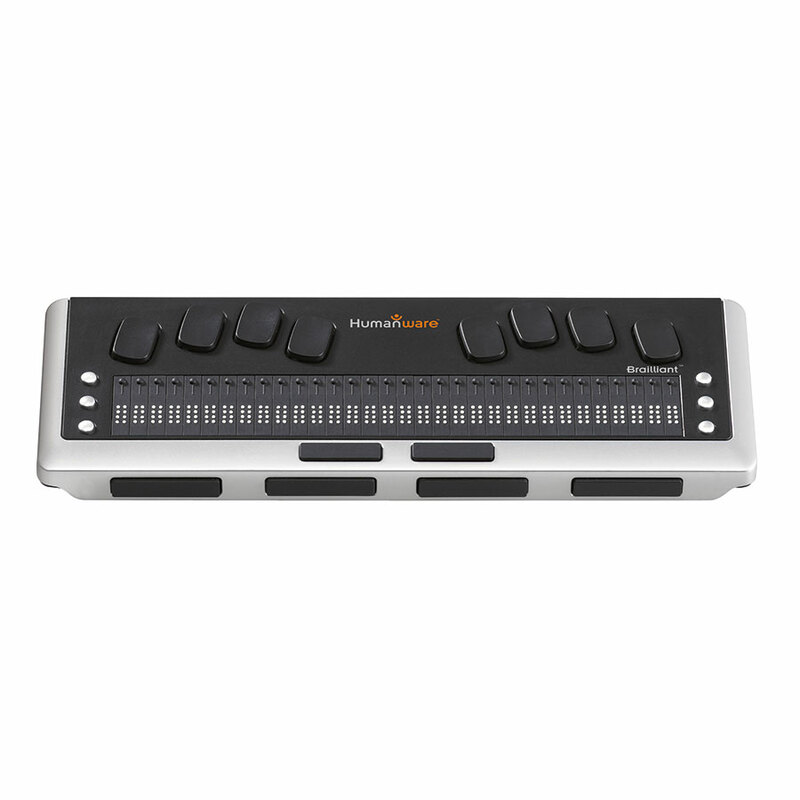 The possibilities, are more than a new and more affordable Braille Display. Ideally we would have first and foremost something that’s low cost and that could render a full page. Upfront that’s our goal. And then, there’s the holy Braille! a typical Windows or Mac interface; there’s icons you click on. Essentially you’re navigating through this digital information in a pretty seamless way. That doesn’t necessarily exist right now for Blind people and having a table that’s able to have a very large array that can change digitally, so can update at a very fast speed, you can imagine some kind of user interface that a blind person could potentially be clicking on icons and feel those icons and be able to navigate around digital content in a similar way that sighted people do using the typical interfaces that we interact with day to day. A portable device you could carry around with you. Alex and the rest of the team are hopeful that once this technology is proven and ready for prime time other developers will begin to create on top of their technology. Similar to other inventions that sparked new development like the development of the iPhone gave birth to the creation of millions of apps doing everything from playing silly games to potentially detecting cancer. a prototype is not that far away. The project is currently in the proof of concept phase. Meaning the first goal is to prove the capabilities of the underlying technology that drives the product. In July, Alex and the team will be displaying this technology at the Euro Haptics Conference in London. less than 10 percent of children with vision loss read Braille. This is on par with adult counterparts. Research has shown a direct relationship between Braille and employment. Among those who are blind and employed, over 80 percent are Braille readers. less than 10 percent reading braille, there’s a strong need for increased access and affordability. And then, an often forgotten segment within the blind community are those who are both deaf and blind. Braille is their access to the digital information. Improved digital access makes sense. Our lab is called the Haptix Lab (H A P T I X) and if you just Google search “Haptix Lab” we’re the first thing that comes up! This is Thomas Reid, for Gatewave Radio. Posted by T.Reid	on Jun 15th, 2016	and is filed under Access Technology, Accessibility, Audio, Blind Tech, Blindness. I ver happy when heard your project. In Thailand we follow up the news of new Braille display timely. If you have the news about your project, please let’s me know. Yes, I hope to be able to follow up in the future. Additionally, see the link to their site in the resources for the latest updates. Thx for listening!